"01010100 01110010 01101001 01110101 01101101 01110000 01101000 <3,"
^ Phoenix Mars Mission - Home. phoenix.lpl.arizona.edu. [2018-02-03]. （原始内容存档于2008-03-04） （英语）. ^ JPL.NASA.GOV: News Releases. 2008-05-28 [2018-02-05]. （原始内容存档于2008-05-28）. ^ Smith, Peter. Snow On Mars!. Forbes. [2018-02-05] （英语）. ^ NASA - NASA's Phoenix Mars Mission Gets Thumbs Up for 2007 Launch. www.nasa.gov. [2018-02-05] （英语）. ^ Mars Phoenix Lander. 2014-08-09 [2018-02-05]. （原始内容存档于2014-08-09）. ^ NASA Has a Problem Calculating - and Admitting - What Space Missions Really Cost | SpaceRef - Your Space Reference. www.spaceref.com. [2018-02-05] （英语）. ^ Phoenix Mars Mission - Mission - Science and Technology - Spacecraft and Science Instruments. phoenix.lpl.arizona.edu. [2018-02-05] （英语）. ^ 10.0 10.1 II, Thomas H. Maugh. Phoenix Mars Lander won't rise again. Los Angeles Times. 2010-05-25 [2018-02-04]. ISSN 0458-3035 （美国英语）. ^ Dear Phoenix Mars Lander, Will You Rise From The Dead? : Discovery News. 2010-05-20 [2018-02-05]. （原始内容存档于2010-05-20）. ^ II, Thomas H. Maugh. Phoenix Mars Lander won't rise again. Los Angeles Times. 2010-05-25 [2018-02-03]. ISSN 0458-3035 （美国英语）. ^ Phoenix Lands on Mars!. NASA. 2008-05-25. ^ Rayl, A. J. S. Phoenix Scientists Confirm Water-Ice on Mars. The Planetary Society web site. Planetary Society. 2008-06-21 [2008-06-23]. （原始内容存档于2008-06-27）. ^ Johnson, John. There's water on Mars, NASA confirms. Los Angeles Times. 2008-08-01 [2008-08-01]. ^ Garner, Rob. Curiosity's SAM Instrument Finds Water and More in Surface Sample. NASA. 2013-09-26 [2018-02-05]. ^ 23.0 23.1 Phoenix Mars Mission - Mission. phoenix.lpl.arizona.edu. [2018-02-03] （英语）. ^ Phoenix Surpasses 90-day Milestone - Sky & Telescope. Sky & Telescope. 2008-09-05 [2018-02-03] （美国英语）. ^ Sun Sets on Phoenix, NASA Declares End of Mission. [2008-12-30]. （原始内容存档于2008-12-30）. ^ Phoenix Mission Status Report - NASA Jet Propulsion Laboratory. 2012-03-08 [2018-02-03]. （原始内容存档于2012-03-08）. ^ Madrigal, Alexis. Mars Phoenix Lander Runs Out of Juice. WIRED. [2018-02-03] （美国英语）. ^ Phoenix Mars Mission -. phoenix.lpl.arizona.edu. [2018-02-03] （英语）. ^ NASA to Check for Unlikely Winter Survival of Mars Lander - NASA Jet Propulsion Laboratory. 2010-01-20 [2018-02-04]. （原始内容存档于2010-01-20）. ^ No Peep from Phoenix in Third Odyssey Listening Stint - NASA Jet Propulsion Laboratory. 2010-11-03 [2018-02-04]. （原始内容存档于2010-11-03）. ^ Spaceflight Now | Breaking News | Orbiter camera sees ice-covered Phoenix lander. www.spaceflightnow.com. [2018-02-04]. ^ Phoenix Amid the Winter Snow - News from Sky & Telescope - SkyandTele…. archive.is. 2013-02-02 [2018-02-04]. （原始内容存档于2013-02-02）. ^ The end of Phoenix. www.planetary.org. [2018-02-04] （英语）. ^ Frost-Covered Phoenix Lander Seen in Winter Images. NASA/JPL. [2018-02-04]. ^ Hello Spacecraft? Are You Listening?. 2011-05-10 [2018-02-04]. （原始内容存档于2011-05-10）. ^ NASA - Bright Chunks at Phoenix Lander's Mars Site Must Have Been Ice. www.nasa.gov. [2018-02-03] （英语）. ^ Alliance Spacesystems | Composites. Structures. Heritage.. www.alliancespacesystems.com. [2018-02-03]. （原始内容存档于2011-05-15） （美国英语）. ^ Phoenix Mars Lander - SSI. 2006-10-11 [2018-02-03]. （原始内容存档于2006-10-11）. ^ Phoenix Mars Mission - Mission - Science and Technology - Spacecraft and Science Instruments. phoenix.lpl.arizona.edu. [2018-02-03] （英语）. ^ Science|Business Imperial technology scanning for life on Mars. 2008-05-29 [2018-02-04]. （原始内容存档于2008-05-29）. ^ AFM on Mars. 2008-05-31 [2018-02-04]. （原始内容存档于2008-05-31）. ^ Tufts Journal: Corner: Liftoff. tuftsjournal.tufts.edu. [2018-02-04]. ^ Phoenix Mars Lander. 2008-05-28 [2018-02-04]. （原始内容存档于2008-05-28）. ^ 49.0 49.1 49.2 Phoenix Mars Mission - Mission - Science and Technology - Spacecraft and Science Instruments - Microscopy, Electrochemistry, and Conductivity Analyzer (MECA). phoenix.lpl.arizona.edu. [2018-02-04] （英语）. ^ 50.0 50.1 50.2 50.3 Phoenix Mars Mission - Mission - Science and Technology - Spacecraft and Science Instruments - Meteorological Station (MET). phoenix.lpl.arizona.edu. [2018-02-04]. （原始内容存档于2017-07-12） （英语）. ^ 51.0 51.1 Phoenix DVD - What We Do | The Planetary Society. 2007-07-11 [2018-02-04]. （原始内容存档于2007-07-11）. ^ Visions of Mars- What We Do | The Planetary Society. 2007-06-14 [2018-02-04]. （原始内容存档于2007-06-14）. ^ Phoenix DVD. . （原始内容存档于2011-05-11）. 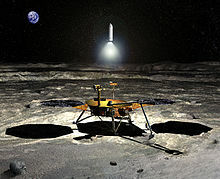 ^ Phoenix Mars Mission - Mission - Science and Technology - Spacecraft and Science Instruments - Spacecraft. phoenix.lpl.arizona.edu. [2018-02-04] （英语）. ^ Vastag, Brian. NASA will send robot drill to Mars in 2016. Washington Post. 2012-08-20 [2018-02-04]. ISSN 0190-8286 （美国英语）. ^ 56.0 56.1 mars.nasa.gov. Overview | InSight. insight.jpl.nasa.gov. [2018-02-04]. ^ Lunar Sample Return Mission. . （原始内容存档于2016年1月12日）. ^ Mars Sample Return. www.jpl.nasa.gov. [2018-02-04].